The Real Deal is heading to the Hamptons! The Real Deal is shipping out to the East End for the third installment of our Hamptons Market Report! The market report picks up where The Real Deal leaves off, with in-depth coverage of the residential and commercial real estate scenes on Long Island’s East End. Once again, the supplement will include a ranking of the area’s top residential brokers and brokerages, a comprehensive overview of Southampton’s revamped retail scene, a who’s who look at the high profile residents shaping the Hamptons and an update on the short-term rental market. Subscribe to receive your copy of the Hamptons Market Report, which will be sent out this July. 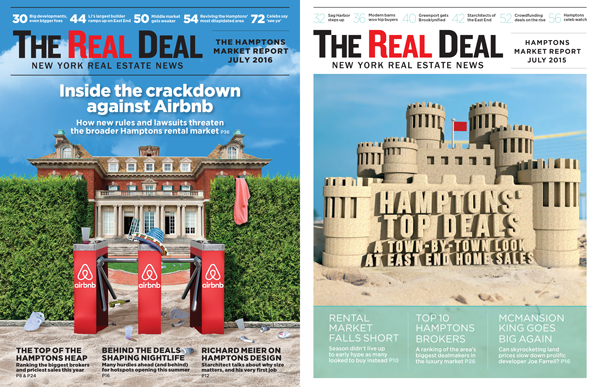 Email Hamptons@TheRealDeal.com to learn more about advertising opportunities.